Before becoming the man who introduced us to the wonders of the sea through his beloved television series, Jacques Cousteau was better known as an engineer and the inventor of scuba. He chronicled his early days of underwater adventure in The Silent World—a memoir that was an instant, international bestseller upon its publication in 1954. 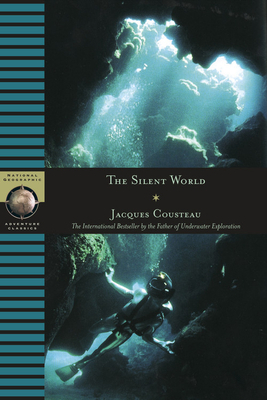 Now, National Geographic presents a 50th anniversary edition of this remarkable book, allowing readers to once again travel under the sea with Cousteau during the turbulent days of World War II. Jacques-Yves Cousteau (1910–1997) was a French marine explorer, inventor, filmmaker, and conservationist who sailed the world for much of the late twentieth century, educating millions about the Earth's oceans—and inspiring their protection. Little of it would have been possible without scuba gear, which Cousteau pioneered when, in World War II, he along with engineer Emile Gagnan, cocreated the Aqua-Lung, a twin-hose underwater breathing apparatus. With the Aqua-Lung, Cousteau and his crew were able to explore and film parts of the ocean depths that had never been seen before, resulting in such Oscar-winning movies as The Silent World.